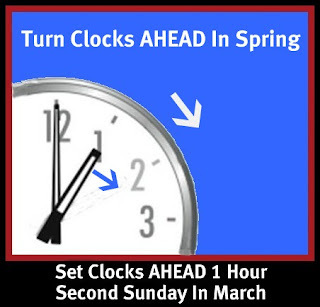 When you go to bed Saturday night be sure to set your clocks AHEAD one hour so you won't be late for work or other important engagements. If you are an old timer like me, it seems it gets earlier every year, and in fact since the passage of the Energy Policy Act, 2007 - 2015 we have been using daylight saving time earlier in the Spring and later in the Fall. I haven't read anything that proves there really is any energy savings as a result, since there are still 24 hours in the day and the sun comes up and goes down whenever it's program says and not when my clock does.